In Vij’s at Home (a fabulous cookbook) Meeru Dhalwala writes that she often teases her husband, Vikram Vij, about his love of meat. She created Spicy Cauliflower “Steaks” with him in mind; it’s a vegetable recipe that he can eat with a knife and fork, just as he would eat a steak. 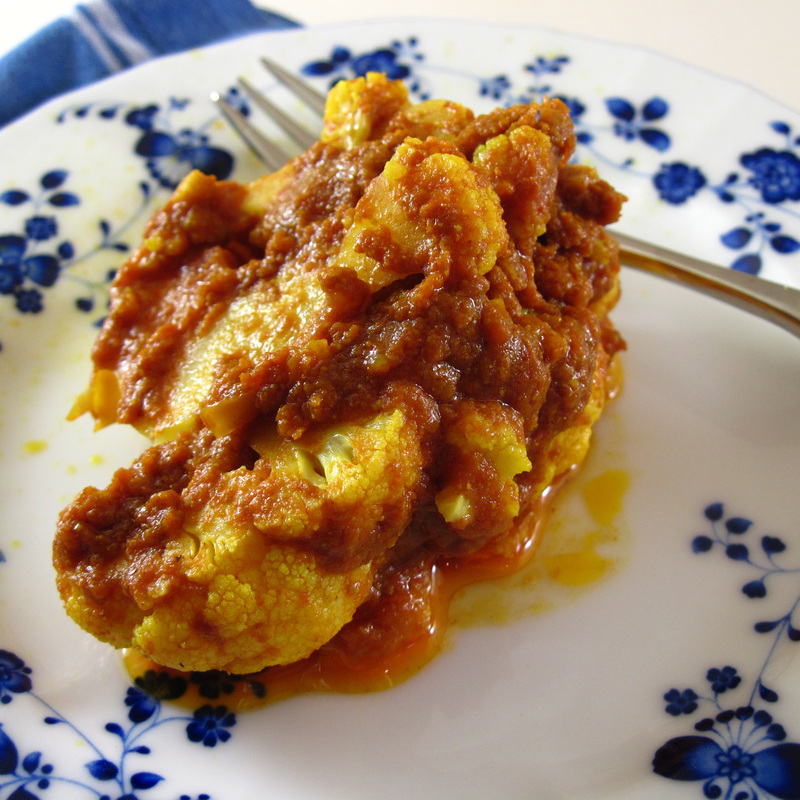 Spicy Cauliflower “Steaks” is a very easy recipe. 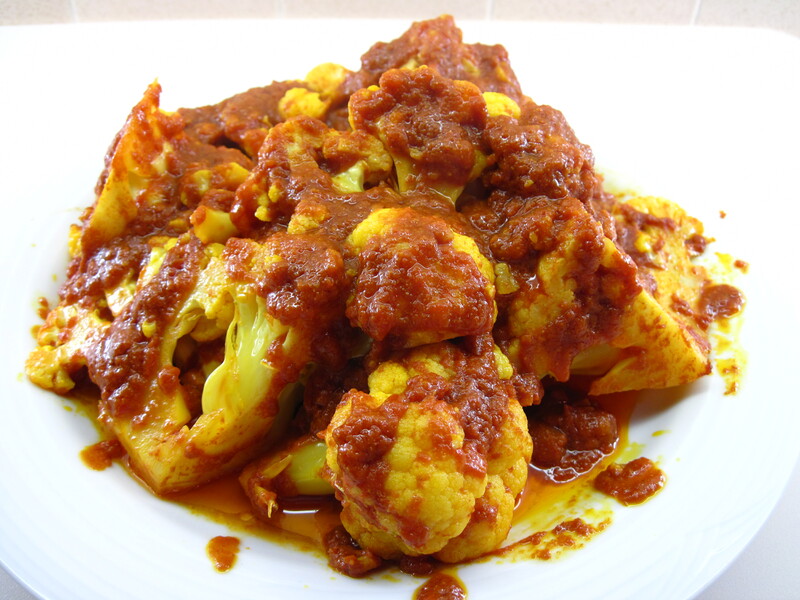 A large cauliflower is cut into 6 or 8 wedges (the “steaks”) and then simmered in a wonderfully flavorful tomato masala. Meeru says you can also break the cauliflower into florets and simmer it, but I thought it was kind of fun to have the “steak” cuts! So how was it? This is possibly the best cauliflower I have ever had in my life! The seasonings are perfect. Bob loved it so much that he ate half of the recipe and he insisted that I had to blog it. I served it with sautéed shrimp and a salad, but I thought my Spicy Cauliflower “Steak” was definitely the star of the meal! Yes, I did eat this for breakfast this morning! 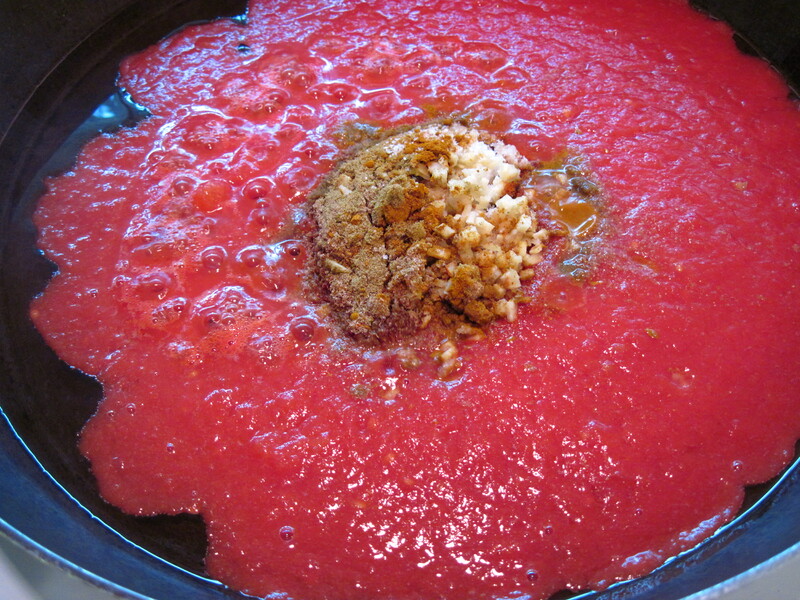 The canned tomatoes I used had no added salt; I used the 1½ teaspoons of salt called for in the recipe and it seemed just right. If I were using salted canned tomatoes, I think I would add all of the ingredients except the salt and then taste it to see if it needed more salt. The recipe calls for, and I used, ½ cup oil. Next time I may reduce that to 1/3 cup. 1. Cut the stalk and the leaves from the cauliflower and cut it into 6 or 8 wedges. 2. Chop the ginger and put it in a small bowl along with the other seasonings. 3. Heat the oil in a large pan. Add the crushed tomatoes and the seasonings. Stir well to mix. 4. Simmer over medium heat for about 4 minutes. 5. 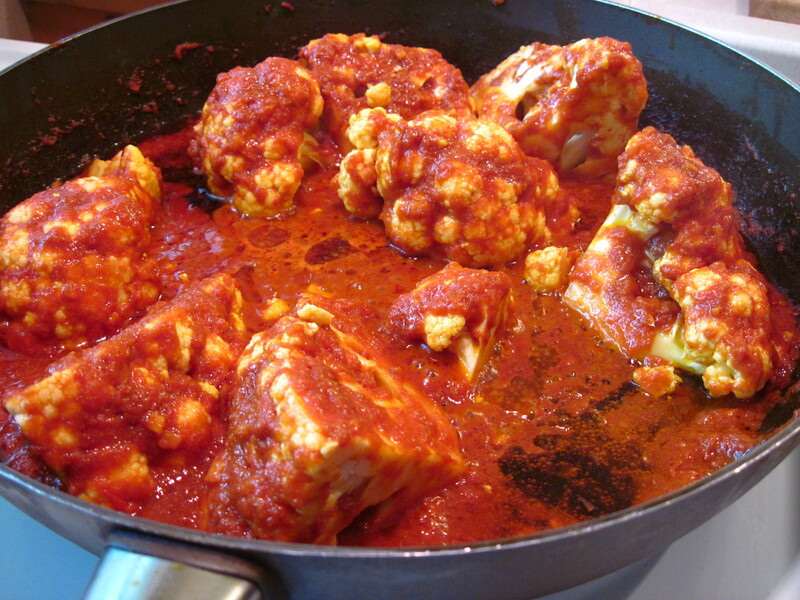 Reduce the heat to low and carefully place the cauliflower “steaks” in the sauce. Spoon the sauce over the cauliflower. 6. Cover and simmer for about 5 minutes. Turn the pieces over and cover and simmer an additional 5 minutes, or until done. In Vancouver, don’t miss Meeru and Vikram’s restaurants: Vij’s and Rangoli. I am super excited about Meeru’s new restaurant, Shanik, coming to Seattle in November! Laughing, because I, too, would totally eat that for breakfast without a second thought. Can’t wait to try it! this is really an interesting recipes! I often have no idea for cooking cauliflowers even if I like them so much!!! I’ll try it and tell you!!! I think you’ll like this, Cle! I think you’ll like it, Mary! These were so very good! Thank you for another amazing recipe, Kath! Thanks so much for your comment, Monet! I’m really glad you liked it. I’ve already made it a second time. We just love it!